For those of a modern persuasion who are contemplating a new kitchen there's a new resource on the internets. 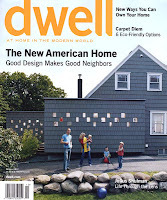 Dwell magazine has launched a kitchen blog. Posts in the past week include Porsche kitchens for guys (although I've never thought of a Porsche as a particularly manly car) and a list of showrooms where you can test drive appliances before you buy them. Now that's a good idea. Ideally, though I'd like to borrow them for a month to really see if they work. I have the feeling I will be spending way too much time on this site getting plenty of ideas for spending way to much money on our kitchen remodel. Making it all about me, there's also a tech blog that features my new duvet cover from CB2.